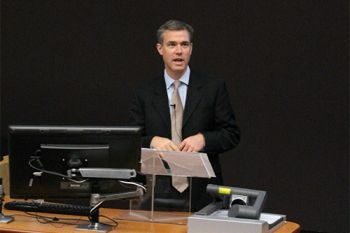 Ed Richards, Chief Executive of Ofcom, delivers the third annual Centre for Law, Justice and Journalism lecture. Who is watching the watchmen? This question has been loudly debated in the papers over the last few months, as print regulation has been on the agenda. Broadcasting already has a regulatory body in place and Ofcom's work seems to be highly appreciated by the public. "Our research show that 70% of the public trust television news, 9% trust radio broadcasters and only 5% trust print media" Chief Executive Ed Richards told an engaged crowd in the Oliver Thompson Lecture Theatre on Wednesday evening. He was there on behalf of the Centre for Law, Justice and Journalism (CLJJ) to deliver their fourth annual lecture. Entitled "Broadcast regulation in a converged world." Mr Richards' talk focused on the struggles of regulation raised by the rapid increase of online media outlets. "Boundaries are blurring fast, services that are indistinguishable from linear media can exist on the same device but does not at all have the same regulation structure that the public is expecting." Mr Richards mentioned that some of the problems with online media is that it is more difficult to regulate offensive material, as explicit graphics can easily be found through Google. He also said that keeping the individual's privacy is less important, and that hate speech spreads more easily through various forms of social media. "The virtual world of social media is not as much of a wild west as some of us thought; there are guidelines and online filters that play an important role." He also took the opportunity to mention the Leveson inquiry, highlighting some measures he thought were crucial for effective self-regulation. Being "safeguarded from undue influence", conducting "clear and transparent processes" and independent funding, were discussed, as well as "the alignment of incentives amongst the public and the industry." He concluded by saying that Ofcom will continue to regulate linear media, and will most likely expand to online media in some form over the coming years. However, even though the situation is already problematic eventual interventions online were explained as being relevant first in a couple of years.